Introducing the Knitting Chart Sketch Toy! 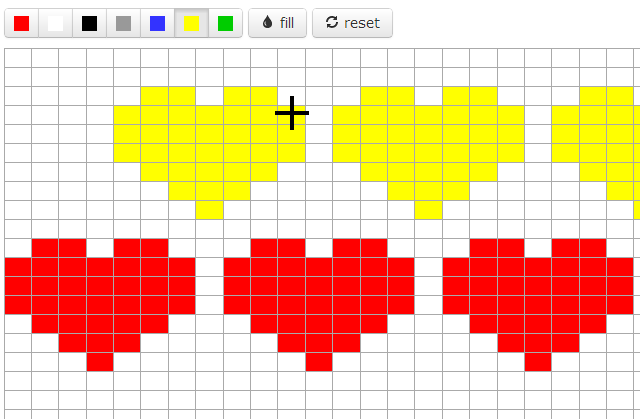 The Chart Sketch Toy is a little tool I’ve built to help with designing stranded and intarsia knitting patterns. I have long been frustrated with how hard it is to sketch out colour-work ideas. I like to work with a rectangular grid that matches the working tension, ensuring that the knitted pattern is the same shape as the design. Until now I have used either pencil and PDF grid generator (with lots of rubbings-out) or drawing software suited to creating finished charts for publishing, but laborious for trying out a motif. There are, of course, specialist charting software packages, but none of them are free and they are also more geared to publishing. And so the idea was born for a browser-based tool that would do simple click-and-fill on a rectangular grid. It turned out to be a straight-forward thing to build, I had a working prototype in a few hours. It took a little bit longer to debug, polish and drop into the website template. But here it is, ready just in time to draw some Valentine’s hearts! It’s already come in handy on my own projects – I used it for the patterns on the tiny man suit. That is wonderful! Thank you so much for putting this together.